Sand Dunes aglow is the latest original oil painting of a path through the dunes to a beach. The late afternoon glow from the setting sun casts violet shadows across the sand. This original oil painting on canvas is a wide horizontal format. 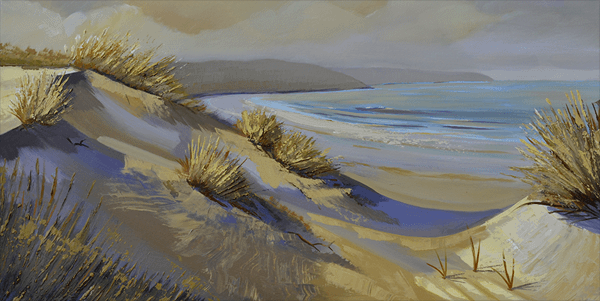 The painting features fabulous textured dune grass throughout the scene. This texture creates an almost 3-D effect on the canvas. The closeup image above shows some of the texture in this original oil painting of the sand dunes. The heavy application of paint on the canvas actually creates shadows on the canvas and looks 3 dimensional, and you don’t need 3-D glasses to see it! The sand dunes have wonderful color throughout the oil painting. The background sky and water have a luminosity that is hard to capture in a computer image. This painting is glowing when it is displayed on a wall. Use the contact page or the comment box below if you would like more information or would like to see the sand dunes painting in person. Soon I will also be posting this oil on the seascape paintings that can be found on the home page of pjcookartist.com. Mercedes, This dune oil painting was fun to paint unfortunately I did not take photos as I was working on the painting. I will try to take photos of each step of my next painting for you to see. Thanks!